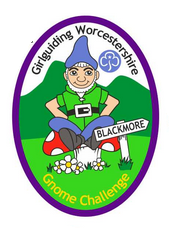 We have set up the Blackmore Gnome Challenge to help raise funds for Blackmore Camp site. The challenge is to collect all 23 names of the gnomes placed around the site and wood area. The 1st letter of all the names then goes on to spell something specific to our county. Once your girls have finished the challenge there will be an opportunity to have their picture taken with our GOLDEN GNOME which is located in Blackmore shop. If you are not visiting our shop please ask your warden to make the golden gnome available for you. We hope you enjoy the Challenge.